There are two bedrooms in 221B, as Mrs Hudson tells John on his first visit to Baker street, in S1E1. Sherlock's bedroom is at the end of the lobby, behind the kitchen. I don't think we ever see John's bedroom, so no wonder it's confusing! We do see Sherlock's in ASIB (maybe at some other time too?). And see Janine coming out of it, so we know it's there! I had forgotten when I first watched the series that Mrs Hudson mentions the 2nd bedroom upstairs, but then it would be mentioned in fanfiction and I watched some scenes over again and there it was! If there's a Season 5 and John returns to Baker Street, I hope the TV show will show us his bedroom! We've gotten to see Sherlock's bedroom, but we've never gotten to see John's. I don't really know why we need to see John's bedroom...less likely to now, anyway. His bedroom is in his own house that he shares with Rosie! True. And Sherlock's bedroom in ASIB was part of the plot, with Irene entering it, and then sleeping in it - it wouldn't have been the same if it had been the living room! I suppose we haven't had a plot-based reason to see John's, so no need to make a new set. We do get a look at his bedroom in the house with Mary in HLV, don't we? With a kind of flashback to his bedroom at the beginning of ASIP. True, but if the show continues to follow canon, he'll be moving back to Baker St. I should like to see his upstairs bedroom if he does! why do you want to see it?! I just remembered that we see it in TLD as well! So probably more shots of John's bedroom than Sherlock's overall, just not the one at Baker Street! In Baker St we only see Sherlock's room, because it's relevant to the story. Well, why not? We get to see Dr. Watson's upstairs bedroom on the Granada series. Why not also on the BBC series? I don't remember why it was in the Granada series...is it the famous incidence of Holmes going to wake Watson up? Anyways, it needs to be plot driven. Yes, I think it was this scene. And the funny thing is - by now I have seen quite a lot of adaptations: Granada, both the Soviet and Russian shows, and we always get a good look at Watson's room. 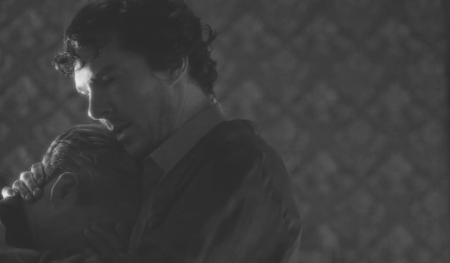 It is an integral part of 221b in those and I really wonder why they never showed it in BBC Sherlock. Totally unimportant to the plot. Maybe also because it would mean building a whole other set? I suppose if it had been filmed in an actual house instead of in a studio, it might have been easier (cheaper!) to show it. I mean, even our Arwel can only do so much! That's true. It's easy to forget that the interior of 221B is not actually a real apartment. Neither was the interior of 221B on the Granada series, but that didn't stop them from showing Dr. Watson's bedroom. Because it was needed for the plot!